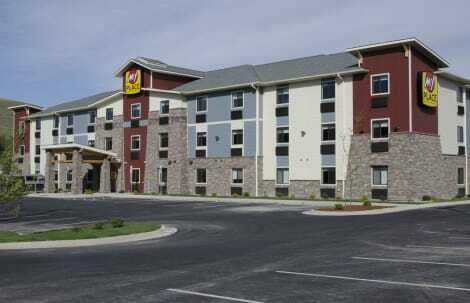 Located in Missoula, Motel 6 University offers rooms with free Wi-Fi. It provides free guest parking. The University of Montana is 1.6 km away. A flat-screen cable TV is provided in each air-conditioned room at this motel. Featuring a bath or shower, private bathrooms also come with a hairdryer. Extras include a work desk and free local calls. A 24-hour reception greets guests of University Motel 6. Other facilities offered include a guest launderette and vending machines featuring snacks and drinks. Missoula International Airport is 8.5 km away from this motel. Montana Snowbowl (ski lift) is 10 km away. The Press Box Restaurant Casino is 3 minutes’ walk away from this motel. With a stay at Mountain Valley Inn in Missoula, you'll be within a 10-minute drive of University of Montana and St. Francis Xavier Church. This motel is 0.2 mi (0.3 km) from Missoula County Courthouse and 0.2 mi (0.4 km) from St. Patrick Hospital. Make yourself at home in one of the 76 air-conditioned rooms featuring refrigerators and microwaves. Complimentary wireless Internet access keeps you connected, and cable programming is available for your entertainment. Private bathrooms with bathtubs or showers feature complimentary toiletries and hair dryers. Conveniences include desks and irons/ironing boards, as well as phones with free local calls. Take advantage of recreation opportunities including an indoor pool and a spa tub. Additional amenities at this hotel include complimentary wireless Internet access, a television in a common area, and a picnic area. With a stay at Quality Inn & Suites in Missoula, you'll be within a 15-minute drive of University of Montana and Rocky Mountain Elk Foundation. This hotel is 1.6 mi (2.5 km) from HUB Family Entertainment Center and 3.3 mi (5.4 km) from Smokejumpers Center. Be sure to enjoy recreational amenities, including a health club, an outdoor pool, and a spa tub. This hotel also features complimentary wireless Internet access and a picnic area. With a stay at Hampton Inn Missoula in Missoula, you'll be within a 15-minute drive of University of Montana and Rocky Mountain Elk Foundation. This hotel is 1.8 mi (2.9 km) from HUB Family Entertainment Center and 3.6 mi (5.7 km) from Smokejumpers Center. lastminute.com has a fantastic range of hotels in Missoula, with everything from cheap hotels to luxurious five star accommodation available. We like to live up to our last minute name so remember you can book any one of our excellent Missoula hotels up until midnight and stay the same night.